Tuscany is a region of Italy roughly in the centre of the west coast. It is home to many historical towns and cities, some of which date back to the Etruscan civilisation. Florence is the capital city of the region; with hundreds of beautiful buildings, galleries and some very famous works of art such as Michelangelo`s David, making it one of the most popular tourist destinations in Italy. Tuscany is also known for its gorgeous countryside, food and wine; anyone visiting will want to get out and about in the hills and vineyards and cycling is probably the best way to do this. The climate is generally well suited for cycling, with warm summers and especially nice weather along the coast. The winters to the east and north can get a little chilly but this may be preferable to some who would rather exert themselves in cooler temperatures. The landscape is hilly, but a well-planned route can avoid the steepest hills and after all half of the time you`ll be travelling downhill! 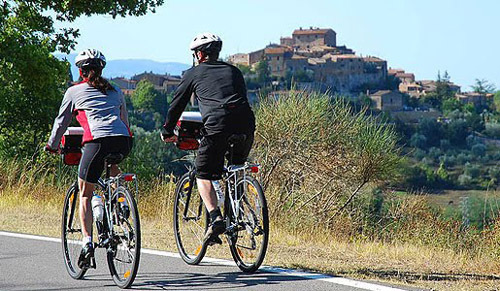 Cycling tours around Tuscany are very popular; you can join an organised tour that is suited to your ability as there are plenty about. Some will stay at different places each night, some have a central base and consist of daily rides into the surrounding area, the latter are better for a less enthusiastic cyclist as there is always the option to take a day off. The most dedicated and experienced can take a tour through the mountains, but this is not for the faint hearted. Planning your own cycling trip around Tuscany can be a lot of fun; you can go exactly where you want, when you want. There are villas all over the region of various sizes that can be rented out and act as a base for your explorations; choose the location carefully and don`t be too over optimistic about how far you can cycle in a day; the hills and warmer weather may slow you down a little and it is no fun to rush. Cycling is the perfect way to tour vineyards and indulge in a glass of wine with your meals; no argument about who is driving, as long as you are careful not to over indulge. However you are planning to organise your cycling tour, the correct equipment is essential. It is best to take your own cycling helmet with you and then you can be sure of a good fit and perfect condition. Good clothing and shoes are also vital; lots of breathable layers will ensure that you can keep yourself at a comfortable temperature. Many clothing brands such as Volcom Clothing design and make clothes specifically for outdoor sports, as well as accessories like water bottles. 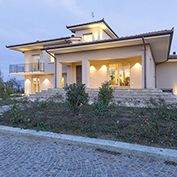 So start planning your route, or book a guided tour and set out on a Tuscan adventure.